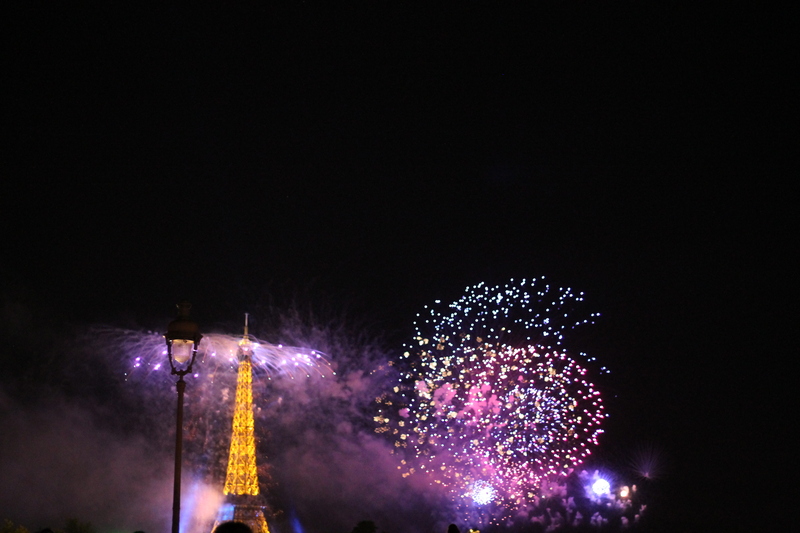 A lot of things happened on Bastille Night. The fun really began when our first guests, Tim and Nancy, showed up at our at our apartment. We sat down in front of some chips, salsa to began our evening together. I personally ate a lot of the chips, which was probably why I couldn’t eat as much at dinner…. oops. Well, to continue on, after our little introductions, we gathered around the table and gladly devoured some ratatouille (no, we did not eat a dvd, if thats what your thinking) . When all of our stomachs were full and all of us were ready to go out, we got up and walked out of our apartment. 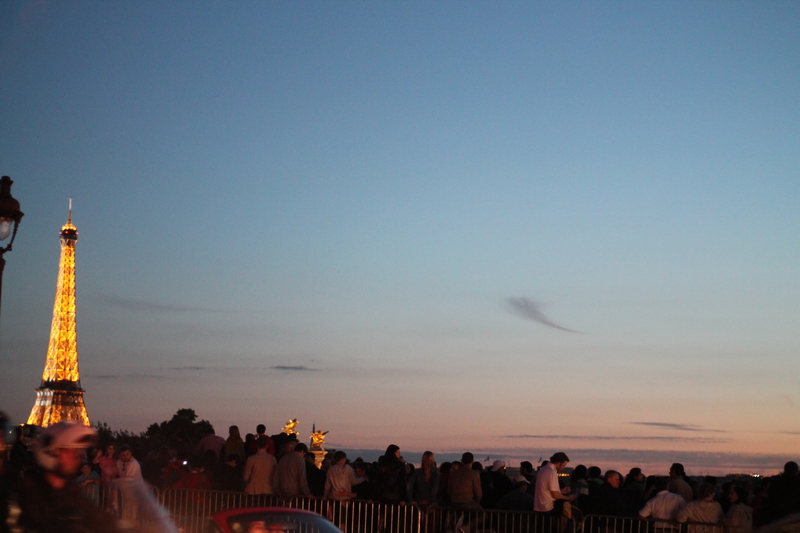 and started to walk to a bridge so that we could view the Bastille fireworks. As we were walking to our destination, we spotted some great things, which my mom was able to take pictures of. Don’t you think this is a cool statue? I think it is. Wow. That must have took a lot of setup. I’m kinda worried for their candle stand. Boom. You can tell that this I big day when you see a flag the size of a building. Literally. 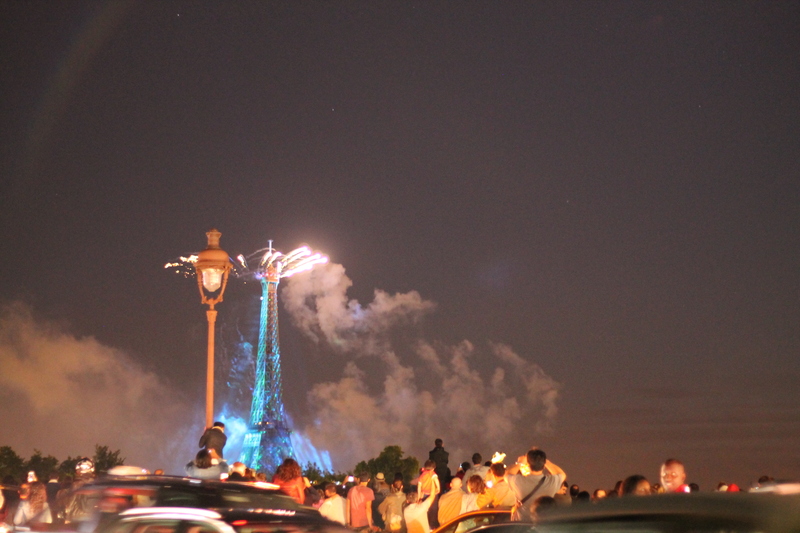 And the Eiffel Tower erupts into awesomeness! And that’s pretty much the day. What’s the building that’s lit up like the French flag? That’s a great set of shots from your Mom! It looks like you had a pretty good view. Sorry we missed seeing the fireworks with you – after all the walking we did, we were completely out of energy. We watched them on television, then fell asleep the second they finished. I hope your immersion classes are going well! Sara – Palais Bourbon is the building — it’s on the Quai d’Orsay, one bridge down from “our bridge”, the Solferino. Ah, merci! I thought maybe it was something I should recognize, but it doesn’t sound too familiar.